This homunculus in a bottle which it was hoped might become at last Man ruling the Earth, this League of Nations as it was embodied in the Covenant of April 28th, 1919, was not a league of peoples at all; it was the world discovered, a league of «states, dominions, or colonies». It was stipulated that these should be «fully self-governing», but there was no definition whatever of this phrase. There was no bar to a limited franchise and no provision for any direct control by the people of any state. India figured-presumably as a «fully self-governing state», an autocracy would no doubt have been admissible as a «fully self- governing» democracy with a franchise limited to one person. The League of the Covenant of 1919 was, in fact, a league of «representatives» of foreign offices, and it did not even abolish the nonsense of embassies at every capital. The British Empire appeared once as a whole, and then India (!) and the four dominions of Canada, Australia, South Africa, and New Zealand appeared as separate sovereign states. The Indian representative was, of course, sure to be merely a British nominee; the other four would be colonial politicians. But if the British Empire was to be thus dissected, a representative of Great Britain should have been substituted for the Imperial representative, and Ireland and Egypt should also have been given representation. Moreover, either New York State or Virginia was historically and legally almost as much a sovereign state as New Zealand or Canada. The inclusion of India raised logical claims for French Africa and French Asia. One French representative did propose a separate vote for the little principality of Monaco. There was to be an assembly of the League in which every member state was to be represented and to have an equal voice, but the working directorate of the League was to vest in a Council, which was to consist of the representatives of the United States, Britain, France, Italy, and Japan, with four other members elected by the Assembly. The Council was to meet once a year; the gatherings of the Assembly were to be at «stated intervals», not stated. Except in certain specified instances the league of this Covenant could make only unanimous decisions. One dissentient on the council could bar any proposal-on the lines of the old Polish liberum veto, (Chapter XXXV, sec 7). This was a quite disastrous provision. To many minds it made the Covenant League rather less desirable than no league at all. It was a complete recognition of the unalienable sovereignty of states, and a repudiation of the idea of an overriding commonweal of mankind. This provision practically barred the way to all amendments to the league constitution in future except by the clumsy expedient of a simultaneous withdrawal of the majority of member states desiring a change, to form the league again on new lines, The covenant made inevitable such a final winding-up of the league it created, and that was perhaps the best thing about it. The following powers, it was proposed, should be excluded from the original league: Germany, Austria, Russia, and whatever remains there were of the Turkish Empire. But any of these might subsequently be included with the assent of two-thirds of the Assembly. The original membership of the league as specified in the projected Covenant was: the United States of America, Belgium, Bolivia, Brazil, the British Empire (Canada, Australia, South Africa, New Zealand, and India), China, Cuba, Ecuador, France, Greece, Guatemala, Haiti, the Hedjaz, Honduras, Italy, Japan, Liberia, Nicaragua, Panama, Peru, Poland, Portugal, Rumania, the Serb-Croat-Slovene State, Siam, Czecho-Slovakia, and Uruguay. To which were to be added by invitation the following powers which had been neutral in the war: the Argentine Republic, Chile, Colombia, Denmark, Holland, Norway, Paraguay, Persia, Salvador, Spain, Sweden, Switzerland, and Venezuela. Such being the constitution of the league, it is scarcely to be wondered at that its powers were special and limited. It was given a seat at Geneva and a secretariat. It had no powers even to inspect the military preparations of its constituent states, or to instruct a military and naval staff to plan out the armed co- operation needed to keep the peace of the world. The French representative in the League of Nations Commission, M. Leon Bourgeois, insisted lucidly and repeatedly on the logical necessity of such powers. As a speaker he was rather copious and lacking in «spice» of the Clemenceau quality. The final scene in the plenary session of April 28th, before the adoption of the Covenant, is described compactly by Mr. Wilson Harris, the crowded Banqueting Hall at the Quai d’Orsay, with its «E» of tables for the delegates, with secretaries and officials lining the walls and a solid mass of journalists at the lower end of the room. «At the head of the room the ‘Big Three’ diverted themselves in undertones at the expense of the worthy M. Bourgeois, now launched, with the help of what must have been an entirely superfluous sheaf of notes, on the fifth rendering of his speech in support of his famous amendments». They were so often «diverting themselves in undertones», those three men whom God had mocked with the most tremendous opportunity in history. Keynes (op. cit.) gives other instances of the levities, vulgarities, disregards, inattentions, and inadequacies of these meetings. This poor covenant arrived at in this fashion returned with President Wilson to America, and there it was subjected to an amount of opposition, criticism, and revision which showed, among other things, how relatively unimpaired was the mental energy of the United States. The Senate refused to ratify the covenant, and the first meeting of the League Council was held therefore without American representatives. The close of 1919 and the opening months of 1920 saw a very curious change come over American feeling after the pro-French and pro-British enthusiasms of the war period. 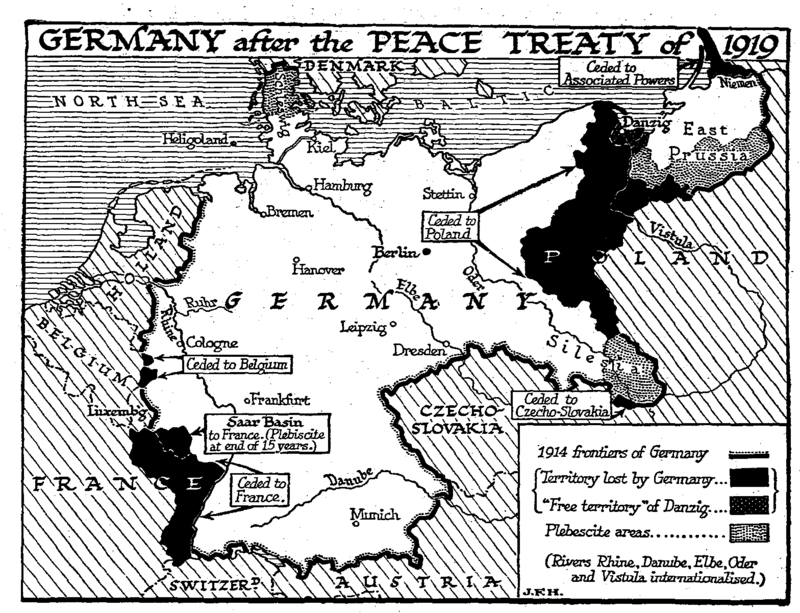 The peace negotiations reminded the Americans, in a confused and very irritating way, of their profound differences in international outlook from any European power that the war had for a time helped them to forget. They felt they had been «rushed» into many things without due consideration. They experienced a violent revulsion towards that policy of isolation that had broken down in 1917. The close of 1919 saw a phase, a very understandable phase of passionate and even violent «Americanism», in which European imperialism and European socialism were equally anathema. There may have been a sordid element in the American disposition to «cut» the moral responsibilities the United States had incurred in the affairs of the Old World, and to realize the enormous financial and political advantages the war had given the new world; but the broad instinct of the American people seems to have been sound in its distrust of the proposed settlement.